When Earth begins having strange weather and seismic events, only disgraced scientist Dr. Zarkov has an explanation: it’s an attack from across outer space. He prepares to fly to the aggressor’s planet in his rocket ship and stop the Moon from falling to Earth, but needs a copilot. Fortunately for him, turbulence causes pro quarterback Flash Gordon and newspaper reporter Dale Arden to crash their chartered plane right into his lab, and he tricks them into his rocket. They cross through the vortex and land on Mongo, the imperial capital of Ming the Merciless, who keeps the princes of the kingdoms under his dominion fighting among themselves so they don’t rebel against him. Ming orders that Zarkov be brainwashed into his imperial guard, Dale be added to his harem, and Flash executed for defiance. Ming’s daughter saves Flash because she finds him attractive, but leaves him with one of her jealous lovers, Prince Barin. Flash believes the only way they can stop Ming is for Prince Barin’s Arborians and Prince Vultan’s Hawkmen to unite, but the only person Barin hates more than Flash is Vultan. I know that George Lucas made Star Wars because he couldn’t get the rights to make a Flash Gordon movie. I wouldn’t have thought I’d ever make a comparison with Star Wars where it was the more realistic side of the equation, but there it is. 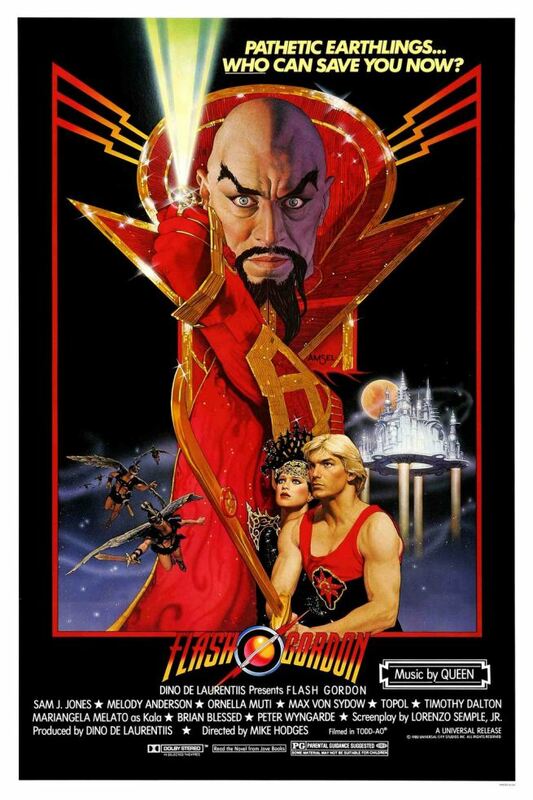 Flash Gordon is not primarily sci-fi, but it makes me concede that Star Wars is. Star Wars is sci-fi with heavy fantasy influence, Flash Gordon is fantasy with an SF aesthetic. And it works surprisingly well. The ship designs draw heavily from the sillier designs of the 30s, but the psychedelic cloud tank footage used for the space they fly in complements them nicely. The first thing that suggested to me that this might be better than I expected was the opening credits. Besides the fact that it’s hard to be pessimistic while Queen plays Flash’s Theme, I saw a lot of names I know and respect. Max von Sydow, Topol, Timothy Dalton, Brian Blessed. I wasn’t sure if they were going to class it up or ham it up, and they largely did both. Combined with the way the design had a subtle undercurrent of realistic detail that 30s serials don’t have (amazing what some stained wood will do), the camp performances were more evocative of Shakespeare than eye rolls. Sam Jones’s Flash himself is a bit bland, but it seems like that’s more from the nature of the character rather than the performance. Flash is just an idealized man without much substance. I was expecting Queen to have half a dozen distinct songs throughout, but instead they seem to have composed some themes used liberally throughout the score, and only one or two sets of lyrics. This does get a bit repetitive, but the motif they come back to the most is the best one, and drives several great moments. As a film released in 1980, this movie feels like the ideas of the 60s and 70s coming out of the haze of that era into the crisp focus of the 80s. It has the ambition of a 70s movie realized with 80s production values, demonstrating that these fantastic concepts don’t have to be treated like an acid trip in order to look and sound good. Some of the effects don’t hold up (for example, the Hawkmen in flight), but an impressive amount does, or is cloaked in a visual style I don’t judge failure as harshly. I had a smile on my face for most of this film, and that’s what matters most.